Directions: Use either Wildcat Canyon Road (from Lakeside) or San Vicente Road (from Ramona) to reach the intersection of the two roads and head 1 mile east. Left on Gunn Stage Road. Follow Gunn Stage Road 2 miles north to the end of the road where the Mt. 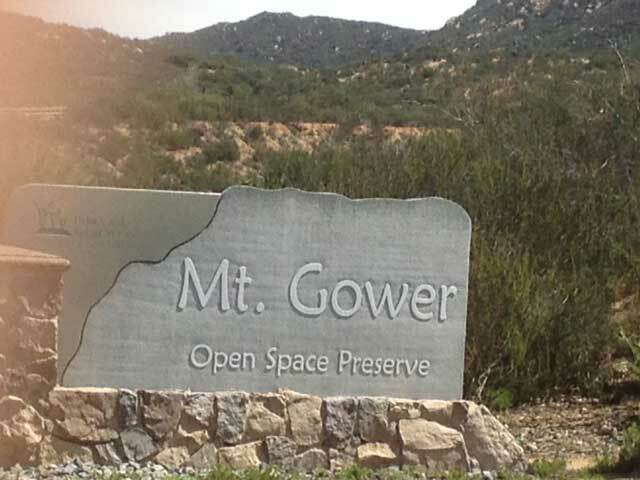 Gower Preserve staging area and trailhead are located. Staging Area: There is ample space for parking. The staging area has a picnic table, toilets and dumpster but no water for horses or corrals. 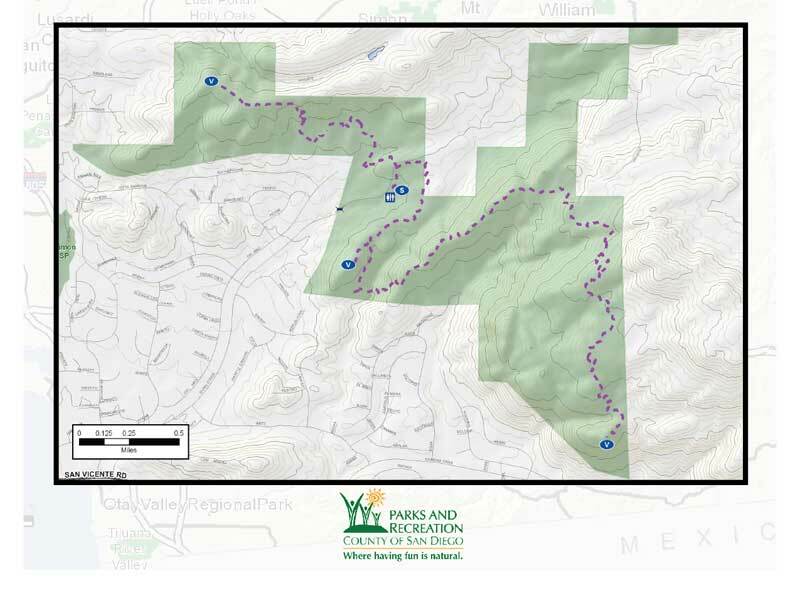 Length of Trail: 8 miles of multi-use trails. Trail Conditions: The trail is open 8 am to sunset and closed in August due to the heat. This is a moderate trail. 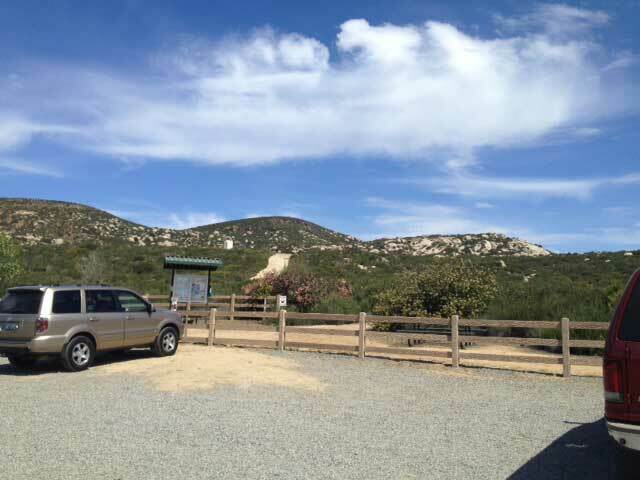 The trail is open to hikers and horseback riders. 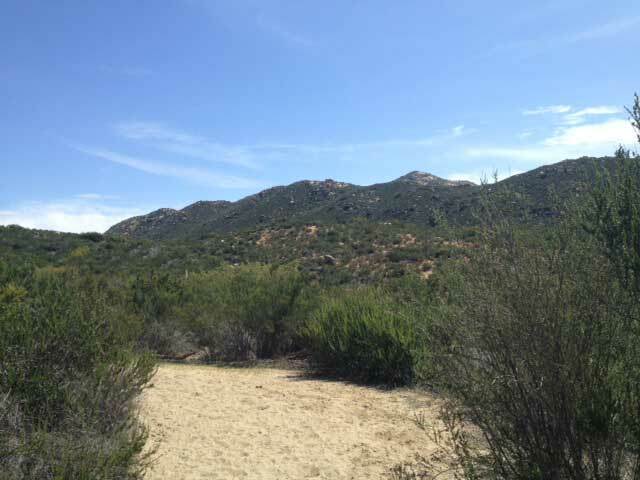 “ Visitors to this nearly pristine wilderness area will experience San Diego's backcountry as it was centuries ago. Consisting primarily of dense chaparral, the Preserve showcases the vegetation community that, perhaps more than any other, evokes Southern California. But there is also a variety at Mt. Gower. Peaceful oak woodlands, shaded streamside bowers, and seldom-visited meadows await the visitor who has the energy and curiosity to explore the 1574-acre preserve. Although hiking is the most typical way people experience Mt. 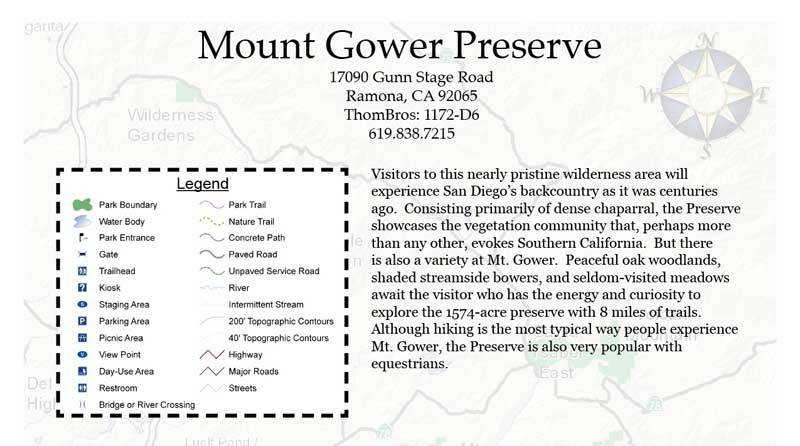 Gower, the Preserve is also very popular with equestrians. Common plants that can be found in the mixed chaparral include chamise, sugar bush, ceanothus, mountain mahogany, and manzanita. Black sage and monkey flowers add vivid splashes of color. Dramatic displays of flowering yucca stalks rise above the chaparral. Several streams support woodlands of sycamore, willow, and oak (watch for poison oak!). Mule deer, coyotes, raccoons, foxes, and bobcats are some of the more conspicuous mammals that live in the park. Among the resident birds, you'll probably see ravens, California thrashers, scrub jays, lesser goldfinches, and red-tailed hawks, and, if you're lucky, a golden eagle. Rattlesnakes are residents here, as are coastal horned lizards and orange-throated whiptails.